Old time pottery, 170 year old Chinese porcelain spoons for USD. 7.50 each & Antique pottery for sale. Sten has spent more than forty years in Southeast Asia designing and engineering various marine structures. His interest in Asia's pottery and porcelain eventually lead to his search and excavation of numbers of ancient shipwrecks. As a championship sailor Sten has extensive knowledge and interest in ancient maritime trade, ships designs and construction. It is these interests and gained knowledge that is the base for all his books and extensive lecturing. Sten's company; Nanhai Marine Archaeology Sdn. Bhd. works with Malaysia's Department of Museums and Antiquities and can therefore offer legally excavated artifacts from these shipwrecks. 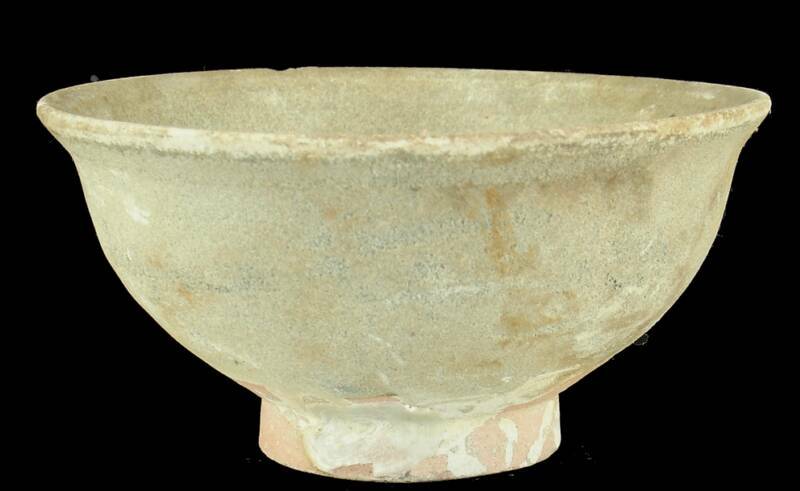 In addition to working with recovering artifacts, Sten has located number of ancient kiln sites in Thailand and in China were his shipwreck ceramics was made centuries ago. He is therefore able to offer absolute provenance on all ceramics sold via Nanhai Marine Archaeology Sdn. Bhd. and, with good conscience sign every Certificate of Authenticity supplied with the artifacts. 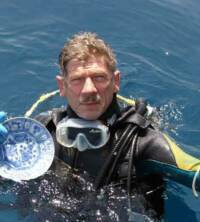 The maritime archaeology of Sten Sjostrand has led to major advances in the study of Asian trade and trade ceramics in Southeast Asia. His meticulous documentation of a series of nine shipwrecks from the 11th to 19th centuries reveals the early dominance of Chinese trade ceramics, a subsequent loss of the Chinese monopoly in the late 14th century when Southeast Asian ceramics entered the market, the basic parameters of the Ming gap shortages of the 14th-15th centuries, and a resurgence of Chinese wares in the 16th and 17th centuries. Just as important, Sjostrand freely shares the information from his discoveries. Researchers are welcome at his headquarters where he documents his finds and patiently answers the queries of others. A lifetime’s experience with the sea and sailing allows Sjostrand to bring new understanding to ancient ship construction, and his voluminous reading allows him to set the ships and their cargoes in historical perspective. These small celadon bottles have lost most of their glaze due to ocean-wear. 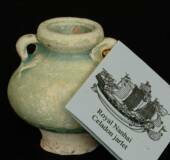 Their low-fired celadon glaze consists of 1.2 - 1.5 % iron oxides that turn green during reduction-atmosphere firing. If sufficient temperature was not achieved, the iron oxide would accumulate on the surface in the form of iron crystals. From prolonged contact with salt water, the crystals will corrode and slowly age the surface. The jarlets were made in two main forms. One is slightly taller and often feature vertical striations. The other is more roundish and usually undecorated. These jarlets were previously thought to hold "precious oil". With the discovery of one shipwreck, the Royal Nanhai, containing thousands of pieces, we now question how much "precious" oil there may have been in the 15th century! This contribution to earlier research is yet another benefit with ship-wrecks: All items onboard must be from one time-period and represent trade wares available at that time in history. These delicate blue & white spoons are each different in design and shape created by the gentle sweep of the old potters thumb. 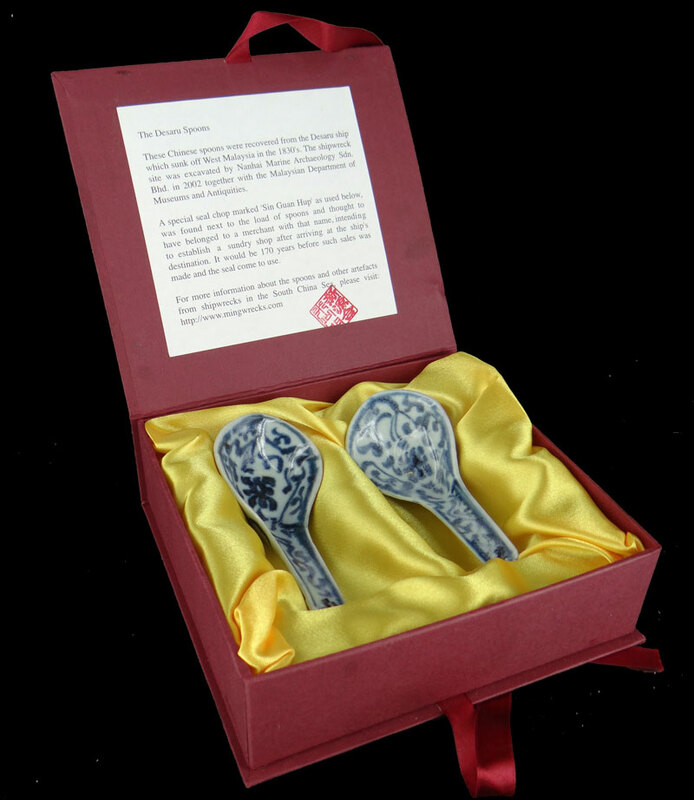 Gift box with silk lining, two spoons and information tag stamped with Sin Guan Hup's original seal. Tall Celadon Jarlet from the Royal Nanhai (c.1460) shipwreck. 5 - 6 cm in height. Individually hand-crafted 540 years ago, these jarlets vary in size and form and carry unique detailing. Since manufacturing they have been worn by the ocean and developed individual characteristics, reflecting their extraordinary history. 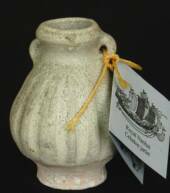 Old time pottery and other collectibles sold here are genuine antiques from our own marine archeological excavations. The collectibles and old time pottery for sale on these pages are the best buy the Internet can offer. 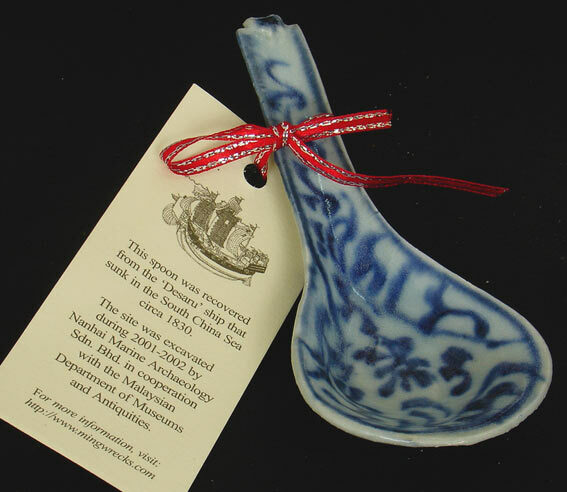 Although genuine historical objects, they are affordable. Since when could you find an 550 year antique collectible for 9 dollars? The below celadon jarlets are genuine antiques and the best buy collectibles available on the net. Spoon with attached information tag. The artifacts sold on this website are therefore legally and properly excavated and can be supplied with an export permit from the Department of Museum in Malaysia should this be required. This unique working arrangement makes us one of the few Internet sellers that sell from own excavation and issues a meaningful Certificate of Authenticity for every artefact with a serial number. (c. 1460) shipwreck. The video include footage from the very first dive on the site by a Remote Operated Vehicle. This type of celadon bowls has deteriorated to various degree during their centuries long stay on the seabed. This deterioration is due to undisolved (low-fired) iron oxides in the glaze matrix. Each artifact is hand made and therefore individual in size, shape and quality. Ordered artifacts may therefore be slightly different from the one shown. We do however assure you that the general appearance (and authenticity) is comparable whilst we will attempt to send items of no lesser quality than that seen on the pictures to the left. Nanhai Marine Archeology LLC. Delaware. USA. as agents for Nanhai Marine Archaeology Sdn. Bhd. Malaysia.